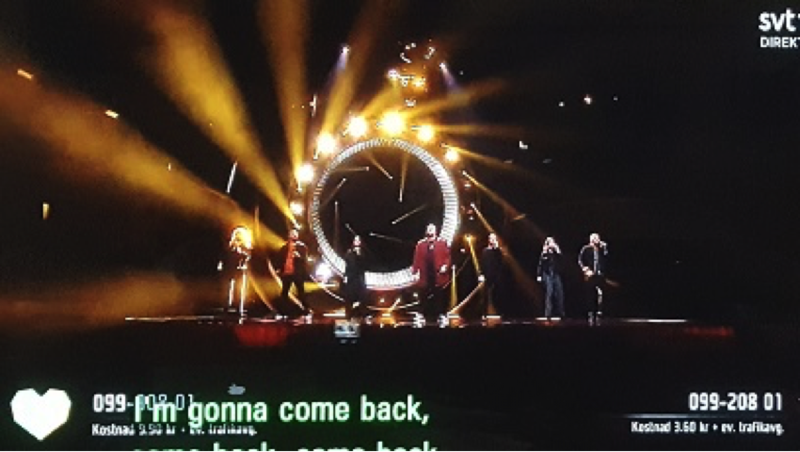 Sweden’s national selection, Melodifestivalen, kicked off with a great new set of hosts, some sass, and seven contenders in this semi-final for the chance to represent Sweden at Eurovision 2019. There are four hosts this year: three from Swedish radio and TV programs plus Eric Saade, who you may remember came in 3rd at Eurovision 2011 with his song “Popular.” Another of the hosts, Sarah Dawn Finer, may be familiar to you from her various comic bits at Eurovision broadcasts over the years as Lynda Woodruff, EBU Spokesperson. The other two hosts are Marika Carlsson and Kodjo Akolor. The hosts opened with a song-and-dance number about giving it all in order to go to Tel Aviv in May. And then the program launched into presenting the seven acts and their songs. If you’ve never watched “Mello” before, it’s a bit of a mix of inspiring interviews with the performers and then the songs themselves. Then there’s a bit of complicated narrowing down of the voting from seven contestants to five, then a revote, and then two competitors advance directly to the grand finale and two competitors get to compete in what’s called Andra Chansen, or “The Second Chance.” The two winners from Second Chance also get to move on to the grand finale. Also, if you don’t speak Swedish, you may wonder why there are two numbers to call for each contestant. One number is just a vote and the other number includes a small donation (approx. $1) to support Swedish Radio. The first competitor was Nano, who competed at Melodifestivalen five years ago. In his interview, he said this song was his comeback. No surprise then that the lyrics of the song included a chorus of “I’m going to come back.” It’s a good song, though Nano didn’t give the best vocal performance. There’s a bit of a gospel feel to the backing chorus. 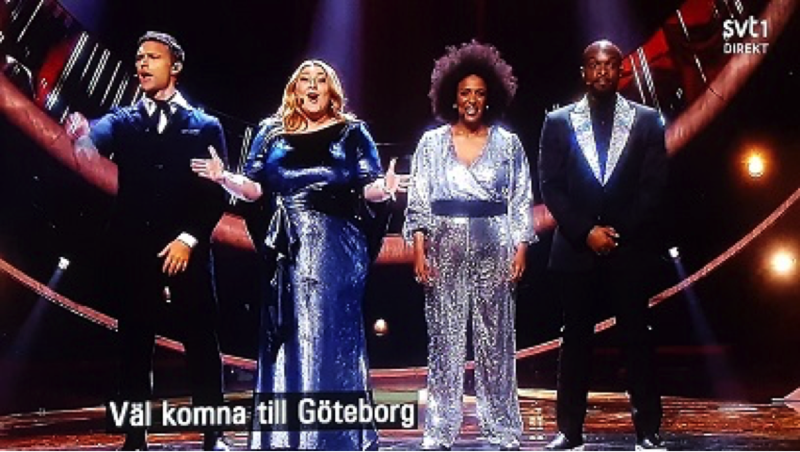 Very uplifting, especially when he sings “I don’t want to stay at the bottom for the rest of my life.” Nano will not be at the bottom as this performance was enough to get him into Andra Chansen. Overall, they could have used a bit more polish and better choreography, but the song was catchy. Alas, this song did not advance. Wiktoria came in 2nd place in Mello 2016, so it’s no surprise that she’s back with a stunner, including a huge on-stage rainfall that soaks her through by the end of her song. In the green room afterward, Kodjo joked that she took singing in the shower to a whole new level. Imagine a modern-day Swedish Viking-ess belting out “Gave you my heart [something-something] not with me” in a rainstorm complete with diamond earrings and a ballgown and you get some idea of the SCHLAGER with all caps that this number evokes. I won’t leave you in suspense: this was the first song to be announced to be moving straight to the grand finale. Female MCs have really taken off in the last year or so in Sweden, so it’s no surprise that this entry starts with a strong kickoff by Anis Don Demina. It was a little surprising that it was a hip-hop duet, with Zeana also rapping. But the chorus is infectious and easily singable after you’ve heard it one time through. Alas, hip-hop isn’t really the right style for Eurovision, but this will be a fun song to stream while stuck in traffic. This song did not advance. The next song is typical for Mello: an anthem in Swedish that will never possibly make it to Eurovision. But it will possibly get some radio airplay on Swedish radio and it will find a certain national audience. This year’s entry is sung by Arja Saijomaa, who last performed at Mello way back in 1987. Her song is about cherishing the Earth and was inspirational. One of the hosts joked with her that she had set a record as the first anti-Donald Trump song at Mello. 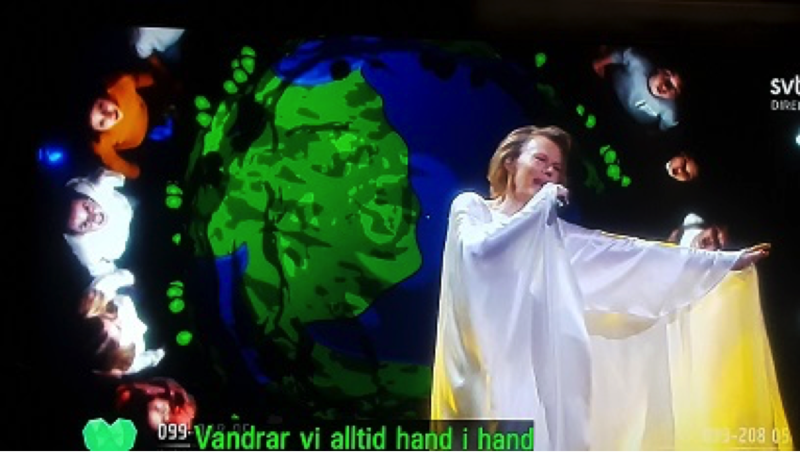 Arja was dressed as a benevolent Mother Nature, all in flowy white, and the song had a children’s chorus, naturally. The children were somehow projected behind her to look like they were floating in space around the globe. I don’t want to sound too snarky as it was earnest and had something important to say, but it was clear this song was going nowhere. This song did not advance. The next song was an instant crowd pleaser with Grammy-winner Mohombi giving us some moves, some falsetto singing, and interaction with an animated specter. The chorus is a repeated Hello (“hello hello hello”), but otherwise a winner. At one point, Mohombi appears to enter the animation, and then both spirits come to life on stage to dance the final chorus. This is the other song to advance directly to the grand finale. The final song was Anna Bergendahl’s Ashes to Ashes. She’s another stately blonde singing a schlager, but this one feels a little more old-fashioned. On a set that is made to look like a forest lit by the rosy colors of a sunset, she sings about finding the fire within to move past your flaws and embrace your inner strength. Anna will have another chance to show her inner strength when she takes this song to Andra Chansen in a few weeks. Finally, as the judges reminded us, if you don’t vote, you can’t complain about the results! Mello only has three more semi-finals and Andra Chansen to go before the grand finale!